Last week was slow for me blogging-wise. Not because of a lack of ideas, mind you, but a lack of time. Sometimes everyday life meddles with the routine. But in this case, it turned it completely upside down. For once, I will share something personal: I hate going to banks. HATE IT! You can ask many things from me, but going to a bank as a favor isn’t one of those I take to gladly. If in the end I have to go, it is because there’s no choice left. And it makes me feel miserable EVERY. SINGLE. TIME. This is not about the concept or purpose of banks in general, but about the specific experience of our bank branches, and the overall treatment of customers. I went to a Banesco branch, with Banesco being one of the most important banks in the country. What was supposed to be a quick transaction became a depressing ordeal. At 9:30 a.m. (only an hour after opening) the place was already filled with people waiting. There was not a line, but instead they all have numbered tickets. People stressed out, even if they got one of the few available seats. As time rolled by, there was something strange with the system: numbers were jumping back and forth. The order was all messed up. The deputy manager was attentive and taking the complaints, but the thing made me lose two valuable hours. It was probably a glitch in the computer, or so I was told. The day after, I returned. The glitch was gone. The big crowd and the slowness were there still. Of the five desks for the so-called “promoters”, only two were working – a natural bottleneck. After 90 minutes, I quit. The business of finding information about an old bank account I had there was left unresolved. I was upset. My hatred of Venezuelan banks comes from my teenage years, when I started to go there to run errands for my mom and dad. The lines alone made me hate them. But as I saw them change and embrace technology, my hopes were dashed – things didn’t improve a bit. No matter if they’re regular bank offices or those located inside malls (with extended workhours), bank offices in Venezuela are always full. ALWAYS. Even with ATMs and deposit machines, people wait for hours and hours. Heck, they would camp there the night before if they could. The worst treatment goes for the elderly, as they must wait all day for their pensions, rain or shine. It’s so unfair to them, it embarasses me to the core. When I went to Germany years ago, the difference couldn’t be larger. Even in Frankfurt, the financial center of Europe, bank offices were almost always empty. If you have to do something face to face, employees treat you well. Machines are fully functional and many don’t even bother to go unless it’s really necessary. They can pay the bills online after all. Of course, we’re not Germans. Most, if not all private banks are not that interested in improving customer service. Public banks are no better, even if they grow larger in number and access. Meanwhile, the Chavernment has not shown any concern. But there was one time when they wanted banks to have public restrooms. In the end, this proposal was just a bluff. The real purpose of this decision was to force private banks to give out more loans. In the end, part of the blame goes to us. We stand in line, suffer all the ordeals, and remain silent. It’s like there a permanent need to do everything personally. There’s a big distrust of the banking system, built on the multiple crises during the decades: from the mega-collapse of the nineties to the recent crash of some minor banks (which led to the creation of one major public bank from the remains of those institutions). At least banks here have adapted to the times, and many operations can be done on the Web, but most Venezuelans lack access to Internet. Also, they prefer to cash their paychecks personally. For those who have to withdraw larger amounts, the issue of personal security enters. Robbers outside could be waiting around, tipped from inside about who they should go after. Banks could do more to improve, and clients would give them some trust in return. I’m not optimistic about that. I know this rant won’t change things. But at least I feel better to let my frustrations out. If this post makes some minuscule impact, I’ll be very surprised. 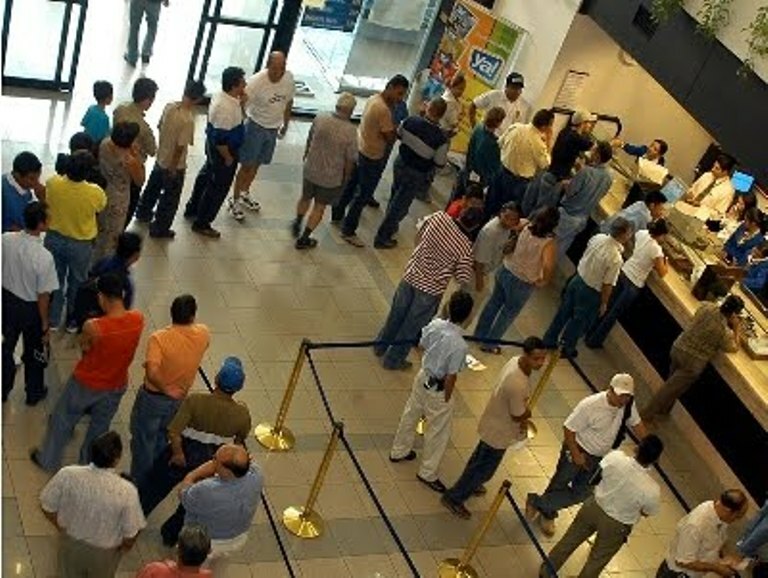 I can tell you this: my personal vision of Hell is a full Venezuelan bank office downtown during payday (quince y ultimo). Full, slow, with half of the tellers out “sick.” And with the computer system down. Sadly, I’ve lived through that a couple of times.